In Canada, Chimney Swifts are listed as Threatened (COSEWIC; 2007). As with many species of insectivores, populations of Chimney Swifts have declined significantly in recent years. Habitat loss and the reduction of sufficient quality/quantity of insect prey are thought to be major contributing factors. It is essential to understand the distribution and abundance of Chimney Swifts, and their biology, in order to implement conservation measures to halt or reverse the population decline. The more we look, the more we discover about Chimney Swifts. In 2015, a group from Manitoba Conservation and Water Stewardship found 3 chimneys in Melita, tantalizingly close to Saskatchewan, which were occupied by swifts. A group of volunteers also located high numbers of swifts in Souris. A quick perusal of eBird revealed that at least 5 Chimney Swifts were active in Estevan in southeastern Saskatchewan. The need for a Chimney Swift monitoring program in Saskatchewan became clear. 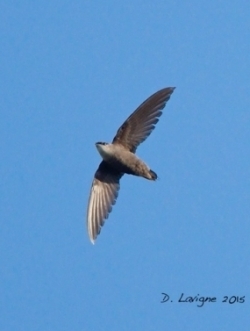 In spring 2016 Nature Saskatchewan began the Saskatchewan Chimney Swift Initiative (SCSI) which is modeled and supported by the Manitoba Chimney Swift Initiative (MCSI). When is it taking place in 2018? There are no specific locations for Saskatchewan, but if you find a roost in Saskatchewan you can monitor it by following the Manitoba and Ontario monitoring dates and submit to the National Roost Monitoring Program (NRMP).